The challenge is, how can consumers discern which products are effective and safe to use when perusing the supplement aisle? Before considering such a question, we must first understand how dietary supplements are regulated in this country. The FDA is charged with regulating dietary supplements under DSHEA. Unlike pharmaceuticals, DSHEA doesn't require supplement manufacturers to establish product safety, health benefits, efficacy, quality, or ingredient integrity before going to market. Consequently, mislabeled and/or contaminated products that could cause harm may find their way into consumers' hands. Only after a supplement has been available for sale can the FDA initiate warnings to manufacturers or pull products from sale if they've been found to be harmful or contaminated. To address issues of quality and integrity, in 2007 the FDA released Good Manufacturing Practices (GMP) to which supplement makers are expected to adhere. The GMP program is intended to protect the public by ensuring manufacturers meet quality control standards in the production, labeling, packaging, and storage of goods. Manufacturers are allowed to set their own standards and methods of measuring quality to meet GMP. Companies may choose to set higher quality standards than others, thus there can be much variability. Moreover, with the many thousands of supplement products available to the public, the FDA isn't equipped to ensure GMPs are met for every product. 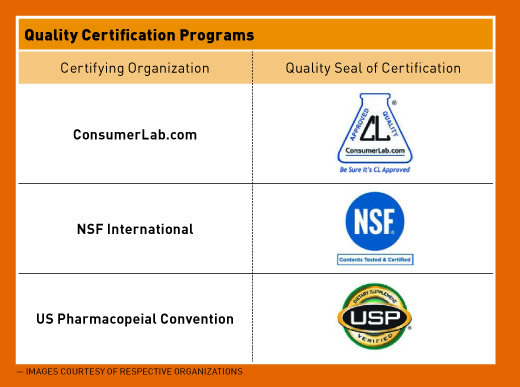 Fortunately for consumers, there are independent organizations that offer quality certification programs to help and encourage dietary supplement makers to meet higher standards of GMP. As part of these programs, dietary supplements are tested for ingredient legitimacy and integrity, product potency, and contamination. Each program issues corresponding marks or seals of certification that can be displayed on participating manufacturers' product labels to alert consumers that the dietary supplement meets the corresponding organization's tests for quality (see table). RDs need to keep in mind, as well as to relay to clients and patients, that these programs don't evaluate product safety or efficacy. They only offer assurances that a product is accurately labeled, free from contaminants, and is made with the ingredients listed on the packaging. That being said, instructing clients and patients to check product labels for one or more of these quality seals of certification is a first step in evaluating product integrity. When considering whether to suggest supplements for clients or patients, RDs can take direction from the Academy of Nutrition and Dietetics' (the Academy) Guidelines Regarding the Recommendation and Sale of Dietary Supplements that can be found on the Academy's website EatRight.org. The following is a sampling of key guidelines for dietitians. The dietetics professional is responsible for reporting any adverse reactions by using available FDA documentation procedures. Referring health care professionals should be notified of any adverse reactions. Dietary supplementation should be complementary to diet. Efforts to improve diet to meet nutrient needs should be made before, or in conjunction with, dietary supplementation. • provide appropriate educational materials to patients/clients about dietary supplements. When advising clients, patients, health care professionals, and the public at large, the bottom line is that RDs should provide education about the implications of dietary supplement regulations and GMP, and instruct clients to, at a minimum, inspect labels for at least one of the quality seals of certification. Dietitians can further empower consumers to educate themselves by contacting manufacturers to request information about the efficacy, safety, and quality of their products. — Andrea N. Giancoli, MPH, RD, is a freelance nutrition and health writer based in Hermosa Beach, California. 1. Kantor ED, Rehm CD, Du M, White E, Giovannucci EL. Trends in dietary supplement use among US adults from 1999-2012. JAMA. 2016;316(14):1464-1474. 2. Dietary supplement usage increases, says new survey. Council for Responsible Nutrition website. http://www.crnusa.org/newsroom/dietary-supplement-usage-increases-says-new-survey. Published October 19, 2017. 6. US Government Publishing Office. Dietary Supplement Health and Education Act of 1994, Public Law 103-417. https://www.gpo.gov/fdsys/pkg/STATUTE-108/pdf/STATUTE-108-Pg4325.pdf. Published October 25, 1994. 7. Cohen PA. The supplement paradox: negligible benefits, robust consumption. JAMA. 2016;316(14):1453-1454. 8. US Government Accountability Office. Dietary supplements: FDA may have opportunities to expand its use of reported health problems to oversee products. https://www.gao.gov/products/GAO-13-244. Published March 18, 2013. 9. Geller AI, Shehab N, Weidle NJ, et al. Emergency department visits for adverse events related to dietary supplements. N Engl J Med. 2015;373(16):1531-1540. 10. Navarro VJ, Khan I, Björnsson E, Seeff LB, Serrano J, Hoofnagle JH. Liver injury from herbal and dietary supplements. Hepatology. 2017;65(1):363-373. 11. Omega-3 fatty acids: fact sheet for health professionals. National Institute of Health, Office of Dietary Supplements website. https://ods.od.nih.gov/factsheets/Omega3FattyAcids-HealthProfessional/. Updated November 2, 2016.